The holidays are behind us and we’ve entered what I think of as the doldrums of winter. The days are ever so slightly longer, but it’s still dark and oh so cold. And when I think of January, I do think of the color gray. After the color of excitement of the holiday season, once the decorations are taken down, things seem just a bit lifeless. How’s that for a peppy opening?? Maybe because it IS a bitter cold and gray day where I am. In any event, I thought gray made the perfect choice for the Color of the Month #COTM for January. I’m actually on the record for not loving the trend of gray we’ve had going on recently. The reality is that while I could never live in an all gray space, I do love the look of them. But they have to be done well. You can’t just plunk a gray sofa into a room with gray walls and call it day. You have to have texture. You have to have pattern. You have to have good lighting. (Okay, good lighting is important at all times!). Moodiness – this really speaks to my January vibe. 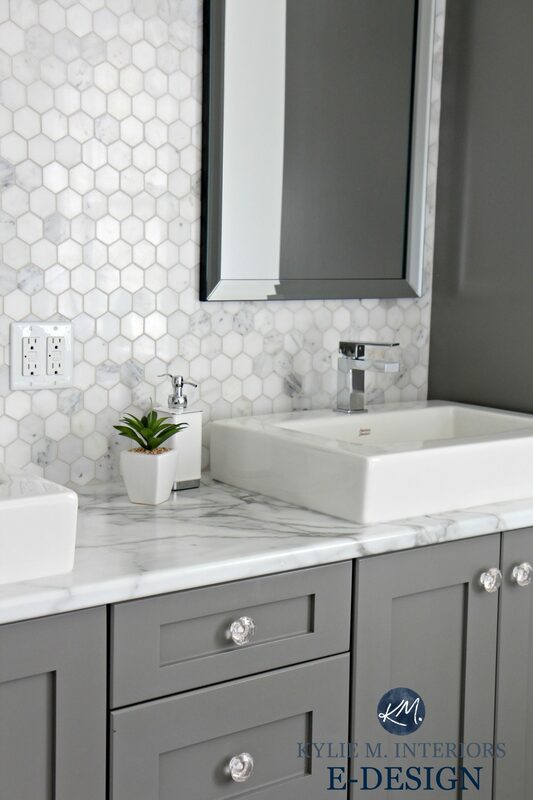 A classic bathroom in medium cabinets with marble hex tiles and for a big cost savings – a marble-look formica countertop. The touch of warmer tones in the yellow pillow (which speaks well to the fire in the fireplace and the warm furry throw ads life to this space. Another paneled beauty is this masculine bathroom. design by Tim Barber Ltd. The simple shapes play well against the serene gray, white and pale wood tone backdrop. design by Alexander & CO. So, how are you feeling about the gray trend that’s been going on for the last couple of years? I’d say if you can do it like the rooms above – fantastic! Otherwise, proceed with caution. I’ve been a fan of the gray trend for several years! I mix it with a lot of orange in our main living areas and love it. I’m really not a fan of beige and white/cream can only do for so long. Gray is such a versatile neutral!! I do love Gray and Orange together, Libby! I love gray, especially as a base for adding in gold or brass. It makes such a lovely combination. Beautiful examples!